This CNC precision machined charging handle is machined to exacting tolerances for a perfect drop-in replacement fit in place of the standard factory cast steel charging handle. It is oversize in length for easier grip and function. In addition to the charging handle itself, the charging handle assembly comes complete with a precision CNC machined stainless steel guide rod and a target recoil spring. 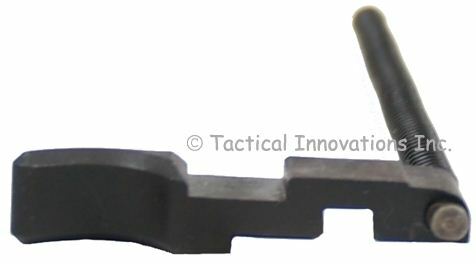 There are two models of this charging handle assembly with the difference being the method by which the guide rod is attached to the charging handle. Although both function identically, the C-Clipped Rod Assembly ($33.95) allows you to disassemble the charging handle assembly for cleaning or to substitute alternate recoil springs. The Crimped Rod Assembly (shown & $27.95), which is assembled identically to the Ruger factory assembly, CANNOT be disassembled.